"at first students were a little surprised to hear the Jay Z or the Notorious B.I.G. whilst they practised, but when they saw how it helped keep their timing in the sequences, they liked it... and it's not just rap, I will also use RnB and my traditional Asian fusion Indian music from great artists like Nitin Sawhney.."
The situation now is that BBC TV, Body in Balance TV SKY 275, and all of London's major nightclubs like Sound, Tiger Tiger, Storm, Zoo, and Metra have supported and held classes in this innovation. 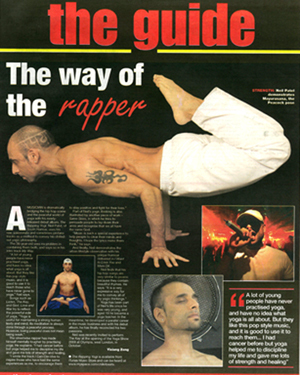 It's still all very fresh in Neil's mind, and his attitude towards yoga itself seems quite interesting considering he is so heavily involved in hip hop. Neil Patel's passion for his work is an obvious selling point, and through his 20 year teaching career you just get a sense that he's going to go from strength to strength doing exactly as he pleases! Why have you chosen to mix these two subjects? What do hip hop and yoga have in common though, apart from this...? You would be surprised! Hip hop is based on poetry. Rappers are basically urban poets. I would say at least 75% of all spiritual scriptures from India are written in verse! And certainly many of the “Bhajans” (Hindu devotional songs) that my family have grown up with have all rhymed! So it’s just about the content of the rhymes – sure some rappers lyrics leave a lot to be desired, but others are truly poetic like Taleb Kwali, Common, KRS1, Chuck D, and even rappers like Eminem have had a lot of insightful lyrics. Then there are the movements! Break dancing and yoga poses are not dissimilar. In my gym I show all the guys the moves like peacock, handstand, crow, headstand and they can’t believe it! Even my break dancing friends want to learn the power poses to help them dance! You also have the fact that both hip hop and yoga are ethnic pastimes originally, so share the same slow and steady influx into western society. 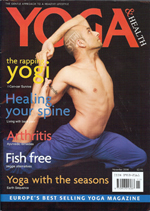 And finally me being a hip hop producer, rapper, and yoga teacher – they have ME in common! So why have you done this? What will you achieve? Well first of all we look for venues with really good sound systems! We’re currently (at time of press) at Sound Nightclub in Leicester Square which has an awesome sound system and DJ Booth... this music provides the backdrop for the synching and choreographing of moves that go on in the class. What you have to understand about hip hop yoga is that the tempo is the all important factor. I will start freestyling movements from yoga and hip hop and timing them with the beats. People get to stretch but also to work in a rhythm – and to enjoy the music! Then we take classical yoga sequences like the Surya Namaskar and flip them up with beats. This is something I’ve done for years in my other classes! We also use Chi Kri Yoga sequences which are also music based with beats I have composed. We then get the hip hop on again and do the breakdance and yoga “freezes” or holds. This is great fun. After that its either a meditation session, a relaxation, some breathing, or an “expression session” where people who rap, sing or dance can express themselves for a few minutes. Sometimes I will rap some philosophical lyrics from my album if I’m in the mood!